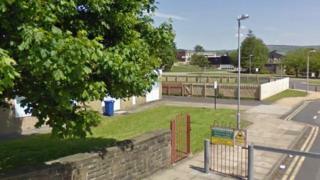 A PE teacher who told a pupil he wanted to "unwrap her" and that he liked "naughty girls" has been struck off. Paul Cuthbertson, 37, taught at South Craven Academy Trust, in Cross Hills, North Yorkshire. A misconduct hearing of the National College for Teaching and Leadership found he "fell significantly short" of expected professional standards. He was accused of inappropriate contact with several pupils, as well as with a parent of a student. The incidents happened between 2015 and the beginning of 2016, the hearing was told. Mr Cuthbertson, who had been employed by the school since 2006 and coached the girls' football team, told one girl he "fancied her all through school and had let her get away with things because he liked naughty girls." He also told a pupil he wanted to kiss her, and asked her to come to his house in a box so he could "unwrap" her. He told another girl he was going to "check out the talent in Aldi." In comments to the girl's mother, the panel heard he had used the term "Bradistan" to describe Bradford, and told her he was a "man in demand". The panel heard he also compared the school's head to to Mr Majeka - a children's book and television series about a wizard teacher. Mr Cuthbertson, who was not present at the hearing, admitted some of the allegations against him, but denied sending Facebook messages to a girl, claiming his account had been hacked. This was dismissed by the panel as "highly unlikely" as Mr Cuthbertson had previously been warned about his behaviour on social media by the school's safeguarding team. He was banned from teaching indefinitely and cannot apply for the order to be lifted until at least 2019.